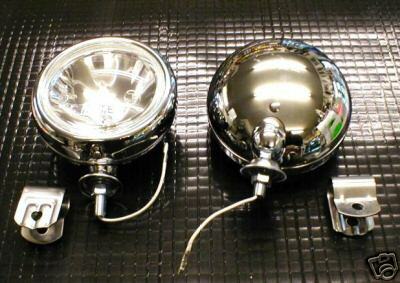 A PAIR OF NEW ,BOXED, CHROME HALOGEN 12V SPOTLIGHTS. THEY CAN BE MOUNTED DIRECTLY ONTO BUMPER OR ONTO A BADGE BAR [SEE OUR OTHER LISTINGS FOR BADGE BARS] .OUTSIDE DIAMETER IS 5 INCHES. THE LAMPS INCLUDE 2 CHROME FIXING BRACKETS . SUITABLE FOR A WIDE RANGE OF CLASSIC CARS PARTICULARLY MGB/ MIDGET / MINI ETC.